Breathtaking. This estate blue sapphire diamond dinner is exquisite. 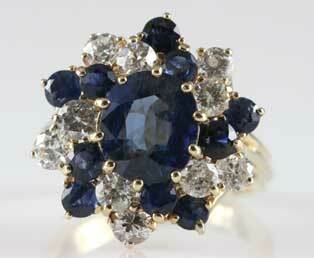 At the heart of this ring is a 3.18 carat dark blue sapphire with violet tones. Five swirling diamond fingers and five swirling blue sapphire accentuate the beauty of this center stone and create a pretty spiral design. Three strong strands of gold forms a three band, sturdy ring shank. Made in 14kt 585 yellow gold.